A proposed ordinance declaring as public nuisance motorcycles and scooters that emit exceptionally loud and annoying noise that affect public health, safety and peace was filed in the city council. Authored by Councilor Redford Erfe-Mejia, the proposed measure seeks to impose fines of PHP1,500 for first offense, PHP3,000 for the second offense and PHP5,000 for the third offense, plus confiscation of license of the driver. In his proposed ordinance, Erfe-Mejia noted numerous complaints mostly from senior citizens, persons with disabilities and sick persons in different barangays that they are greatly disturbed by motorcycles, scooters and other vehicles using mufflers that create exceptionally loud noise sometimes during ungodly hours. He said the noise pollutants in the streets are so loud and annoying that it can lead to permanent hearing loss, serious health problems and even prove fatal in some instances. On the other hand, Councilor Jose Netu Tamayo, a lawyer, prefers that the existing national law prohibiting vehicles with open modified mufflers be applied and implemented, where the minimum penalty for violators is PHP5,000, plus impoundment of the vehicle. Tamayo learned about the national law during the public hearing on the draft Ordinance No. 063, attended by OIC police chief Jandale Sulit, Public Order and Safety Office (POSO) chief Carlito Ocampo, City Legal Officer Victoria Cabrera and Aileen Peteros of the Land Transportation Office. However, since it is a national law, only the enforcers of the Land Transportation Office (LTO) can apprehend motorists for violating the law. The POSO as well as the police cannot apprehend the erring motorists as their deputation by LTO has expired, Tamayo said. Previously, Ocampo and four policemen were deputized by LTO as their agents in Dagupan. For this, Tamayo vowed to pass a resolution in the next session of the Sangguniang Panlungsod to ask LTO Regional Director Teofilo Guadiz Jr. to renew the deputation of Ocampo and the four policemen. Reacting to the draft resolution of Mejia, Tamayo said the city of Dagupan cannot impose higher fines than those prescribed by the national law nor impound the apprehended vehicles as this power is only vested on LTO. Also, only the LTO and its agents can confiscate driver’s license. 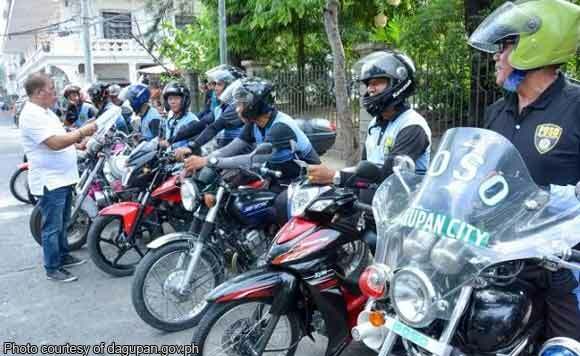 The councilor said motorists, motorcycle riders and tricycle drivers cruising the streets on their motorcycles with modified mufflers at night should be made to pay higher fines as they are disturbing and annoying the people sleeping or resting in their homes.